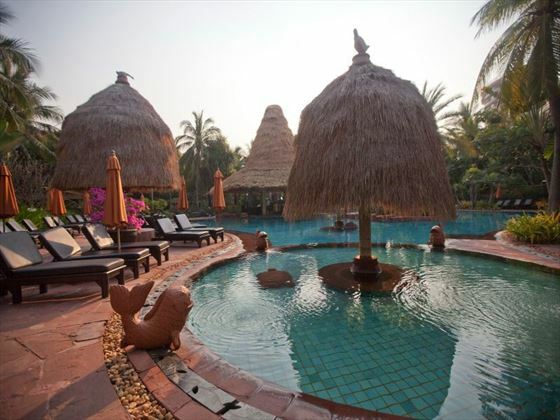 Just three hours south of Bangkok but a world away from the hustle and bustle of the city streets, Anantara Hua Hin Resort presents an altogether more peaceful version of Thailand with plenty of VIP facilities to write home about. This is an absolute joy for couples as from Thai silks and wooden flooring in guest rooms to a fabulous choice of dining venues, there are numerous reasons why romance and Hua Hin deserved to stroll hand in hand. 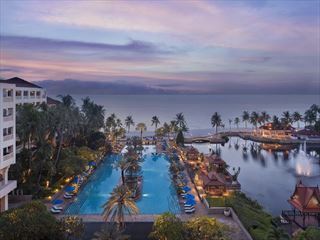 Free form swimming pools, white sand beaches and numerous nearby golf courses enable a complete and utter break from the norm and if you're looking for a luxury Thai resort not far from the capital then Anantara is definitely a worthwhile option. Tropical garden and beachfront setting five minutes from central Hua Hin and within easy access of seven golf courses, Fisherman's Pier and the airport. 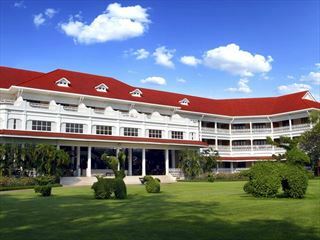 Hua Hin Airport can be reached in under five minutes from the Anantara and is regularly serviced with flights from Bangkok. 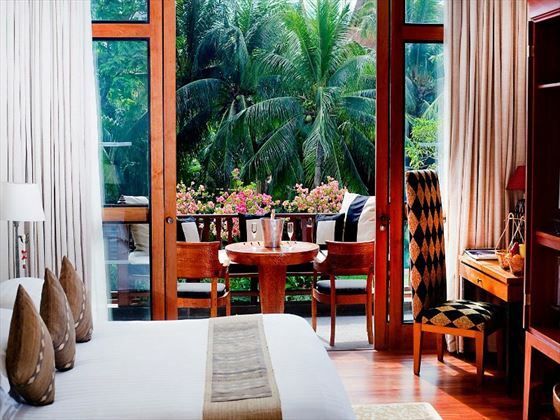 Premium Garden View Room – hardwood floors and traditional Thai silks compliment the double bed, bathroom with terrazzo tub, sliding doors lead to your private garden terrace. 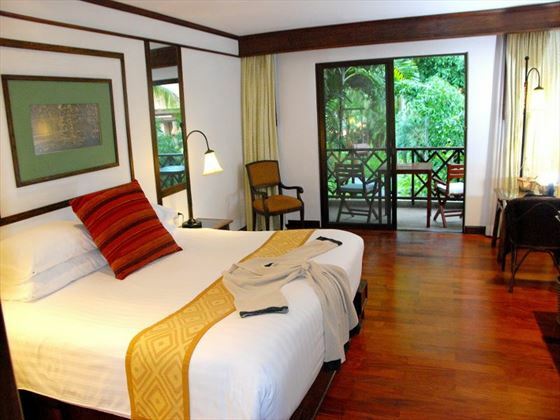 Deluxe Garden View Room – a contemporary feel with hardwood flooring, traditional Thai artworks and silk fabrics. Upgraded technology, including an LED controlled glass walled bathroom with rainshower. Premium sea View Room – same fixtures and fittings as the Premium Garden rooms with a beachfront location complimented by a furnished veranda or stunning sea views from the balcony. Junior Lagoon View Suite – teak floors, high ceilings and bold indigenous fabrics throughout lend a tropical feel with upgraded technology including an iPod docking station, bathroom with terrazzo tub and separate shower, balcony or terrace overlooking the lagoon. Anantara Garden View Suite – larger than the rooms mentioned above, featuring a walk-in wardrobe, spacious sleeping and living area and an oversized balcony complete with built-in daybed. 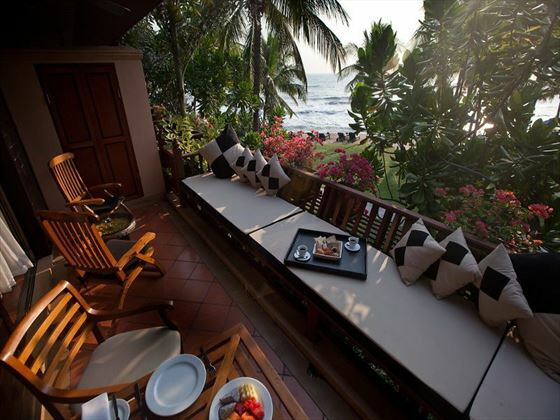 Anantara Sea View Suite – same size, style and features as the Anantara Sea View Suites with the added luxury of sea views from a furnished private balcony. Baan Thalia – stylish Italian restaurant open for evening meals. 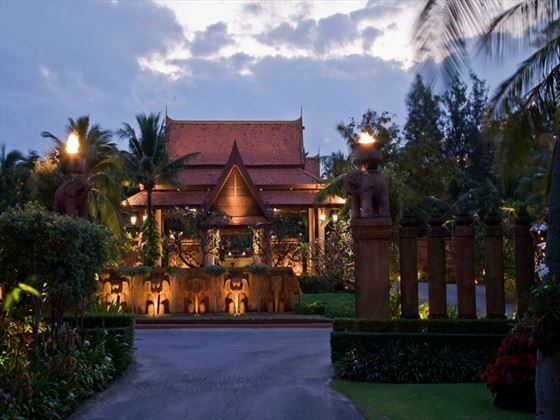 Rim Nam – traditional Thai cuisine served for lunch and evening meals. Sala Siam – laid back tapas, light lunches and lounge snacks served from 10am until late. Sai Thong – seafood and meat barbecue grills on the beach from before lunch until after sunset. Loy Nam – cocktails, refreshments and drinks to be enjoyed by the pool. Issara Café – an international buffet breakfast with a good choice of healthy eating options. Lagoon – snacks and refreshments by the Lagoon pool. Dining by Design – regional and international dishes presented at the private dining venue of your choice, including romantic meals for two on the beach. 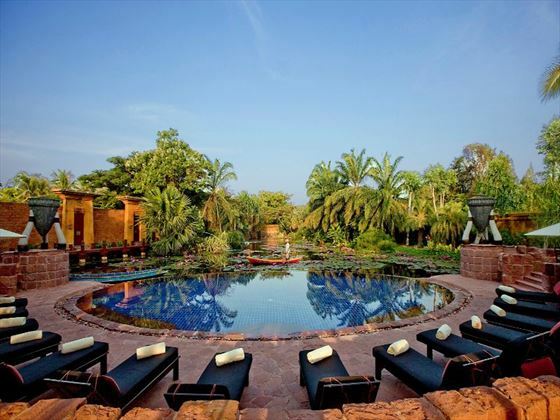 Anantara Spa – traditional and signature treatments, therapies and well being programs within a tranquil courtyard setting which includes seven private treatment rooms. Spice Spoons – learn how to cook traditional Thai dishes under the watchful eye of Anantara's Chef. Cultural and creative activities, such as: fruit carving, garland making and language lessons. Copy of valid Wedding Certificate or copy is required at time of booking and check-in.